Judith A. Brust has been involved in the world of art for more than three decades. She has exhibited her work in a multitude of solo and group shows worldwide, including at Modernism and ART20 at the Park Avenue Armory in New York and at an international juried two-part exhibition at the Hun Gallery in Seoul, Korea. Many of her pieces have found homes in private and corporate collections throughout the U.S., including the permanent collection at the Mandarin Hotel in Boston alongside works by David Hockney and Frank Stella. Working in various mediums, Ms. Brust is best known for her paintings, drawings, sculptures, and large-scale layered monoprints. She studies and draws inspiration from the writings of Carl Jung, Joseph Campbell and Gaston Bachelard, as well as fellow painters and sculptors such as Mark Rothko, Paul Klee, Louise Bourgeois and Eva Hesse. In addition to working as a solo artist in her own studios, Ms. Brust has been a successful gallery owner in Rochester, New York and on Nantucket Island, Massachusetts. In 2004, Ms. Brust established galleryblue in Rochester. She relocated the unique gallery to Old South Wharf on Nantucket in 2006 when she and her husband, Bob, moved to the island. Featuring original, out-of-the ordinary art, the gallery celebrated influential artists reflecting the historically sophisticated and international flavor of Nantucket. Over the years, Ms. Brust welcomed a community of modern artists, both local and national, to exhibit alongside her own works. In addition to recognizing other modernists, both experienced and emerging, Ms. Brust worked with her team at galleryblue to develop community outreach exhibits and shows to benefit local nonprofits such as the Nantucket Marine Mammal Conservation Program and the Nantucket Arts Council. After five years, she decided to expand her reach to a broader audience and focus on her work as an artist rather than as artist-gallery owner. She became affiliated with The Gallery at 35 Main, The Gallery at 4 India Street and Graficas Gallery on Nantucket as well as L’Attitude Gallery in Boston, in close proximity to the Mandarin Hotel permanent collection. On Nantucket, Ms. Brust’s monoprints are housed at The Gallery at 4 India Street. She also participates in exhibitions at the Artists Association of Nantucket’s J. Cecelia and Seward Johnson Gallery. In Boston, her monoprints are exhibited by L’Attitude Gallery at 211 Newbury Street and also can be seen in the private, permanent collection of the Mandarin Oriental Hotel nearby on Boylston Street. Ms. Brust holds an M.A. and M.F.A. from SUNY Albany. 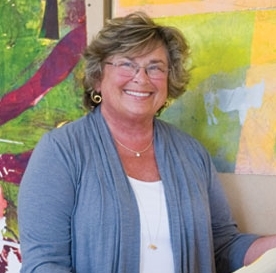 She is an active board member of the Nantucket Arts Council and the Artists Association of Nantucket. In the years to come, she looks forward to continued success within the field of art and also returning to her roots as a sculptor. My work is about life cycle; journey, religion and ritual, generational passage and the map of life. I’ve has been influenced by reading the works of Gaston Bachalard’s The Poetics of Space, Joseph Campbell’s The Power of Myth, Carl Jung’s Man and His Symbols, and Bill Moyer’s Healing and the Mind, and studying artists such as Paul Klee, Mark Rothko, Robert Motherwell, Frank Stella, Jennifer Bartlett, and Robert Moskowitz. Along with my personal life experience, I also find a continued source of reference and inspiration from the works of Eva Hesse and Louise Bourgeois. My monoprints represent my ongoing interest in Life Cycle. However, the issues that I am addressing are not meant to be literally defined. Of more importance is that the viewer respond to these works from his or her own experience and history.